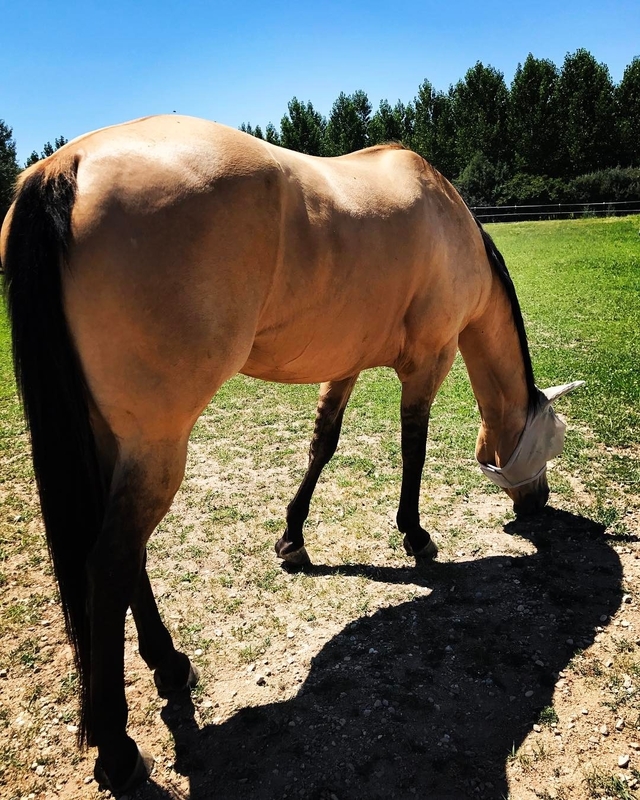 Lola is a 10 year-old Buckskin Foundation bred AQHA-registered quarter horse mare out of Truckles Beau. She was bred in Bliss Idaho by Shelley Fredrickson. Jena Von Teese got Lola just before the mare turned 3 years of age. She discovered her by accident while scrolling through the horse classifieds on the website Dream Horse. She didn’t want a buckskin, a 16-hand high youngster, or even a mare---however that all changed when she met Lola. Lola was perfect, and had the personality and level-headed attitude to match! 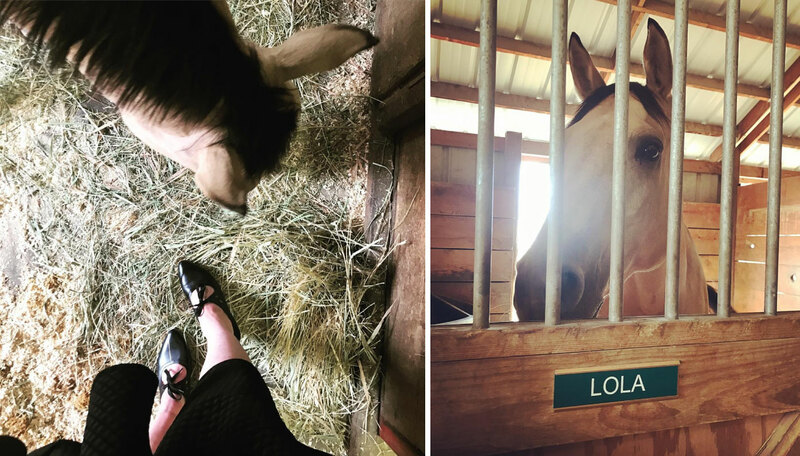 Jena keeps Lola at a local private boarding stable. They have actively showed in dressage and been in full training except for this past season. 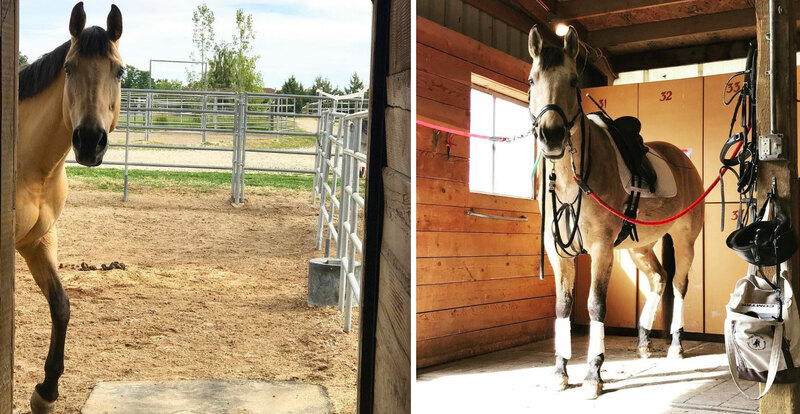 Since Jena’s trainer was moving, she and Lola were the process of changing trainers and without the support of longtime friend and trainer Heather Oleson, Jena decided not to show. Lola was turned out with a companion mare in a paddock with a connected stall with daily pasture turnout. The two horses got along well and were usually calm and non-eventful when turned out together. Over the Labor Day Weekend, Jena had heard some chatter about how Lola was playing and acting a bit wild while turned out in her pasture. She was rumored to have been rearing up and running around like crazy. Then came the call. A couple days later Jena received a call from the barn manager at Lola’s stable, who indicated that they thought the mare seemed “off”. Jena immediately drove to the barn to check on Lola herself. Upon arrival, she took Lola on a lead and evaluated her at the walk. Lola didn’t appear to be lame at the walk. However, when Jena asked the mare to trot, she displayed vague or mild lameness (grade 1 -2 of 5). Jena decided to keep an eye on her for a day or two, and see if it improved at all with some rest. 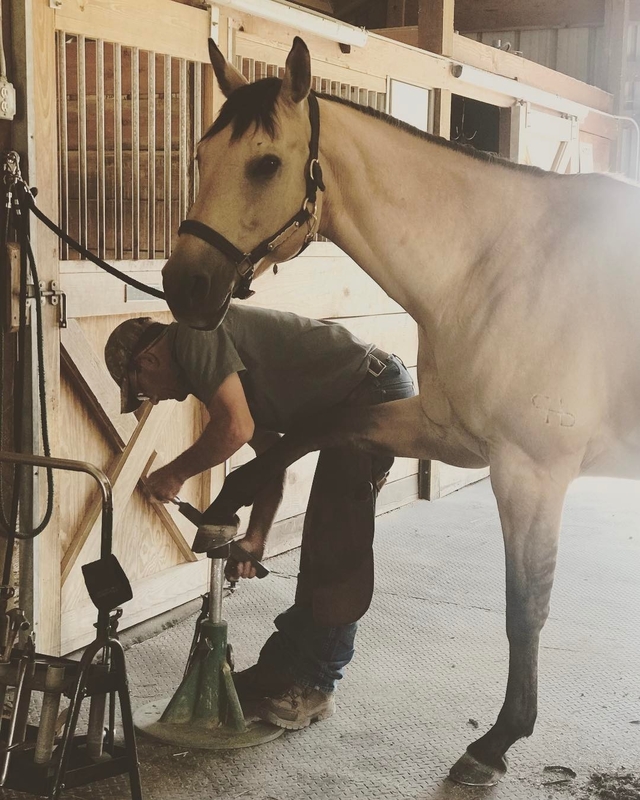 Since Lola was due to be shod by the farrier the next day, she figured that she’d wait and see how she moved after her feet were trimmed. A couple days later, after Lola’s feet were shod, Jena watched the mare trot again on the lead line. Lola still seemed slightly off in her gait. Jena called her veterinarian and friend, Dr. Matt Woodington from Woodington Vet and made an appointment with him to come to the barn and examine Lola. However, the morning of Lola’s scheduled vet visit, Jena received a phonemail from the front office that her appointment would need to be rescheduled. Dr. Woodington was off to the hospital with his wife, who was in labor with their first baby! A couple days later, Dr. Woodington came out to check on Lola. Upon arrival, he initially palpated Lola’s legs and checked the muscles, joints, bones, and tendons for evidence of heat, swelling, pain, or any other irregularities—he found none. Next, Dr. Woodington performed a lameness exam, where he evaluated how Lola moved at the walk and trot, in a straight line and circle. 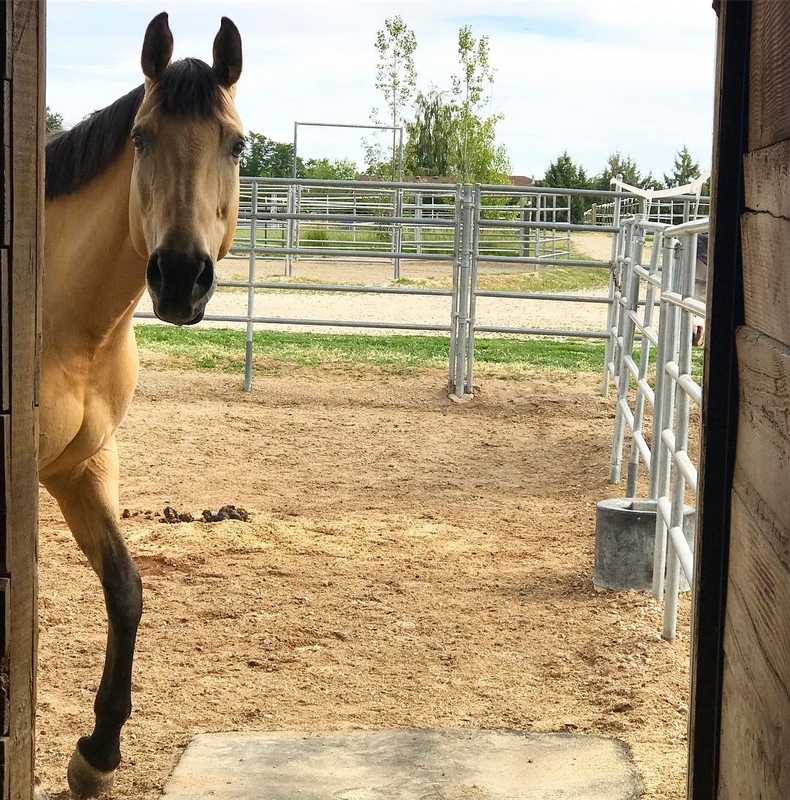 He confirmed Lola was demonstrating mild to moderate lameness (grade 2 -3 of 5), for lameness was consistently observed at both the walk and trot. 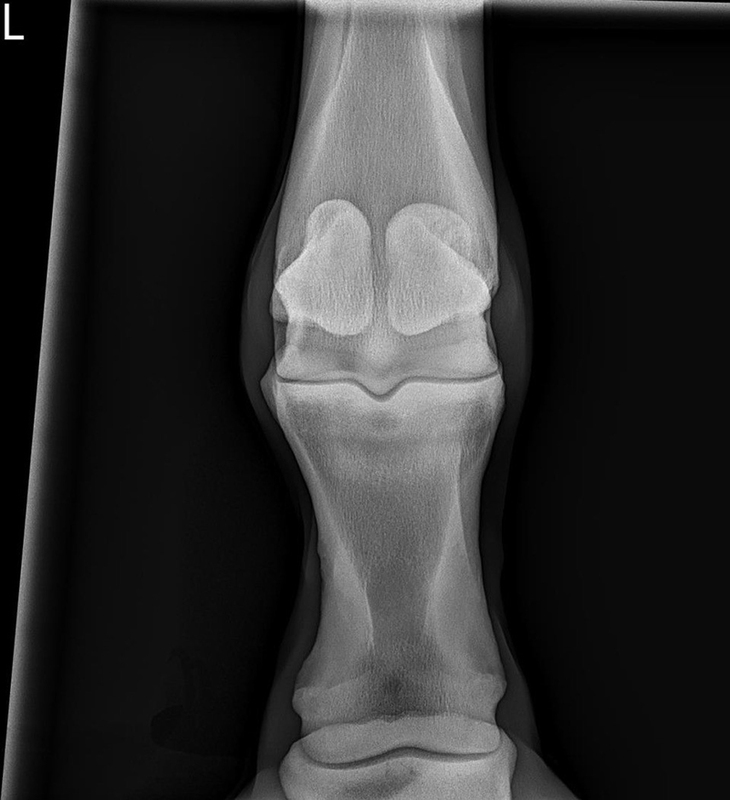 Dr. Woodington recommended proceeding with diagnostic joint blocks, which is an analgesic technique used by veterinarians to help pinpoint the location of lameness. 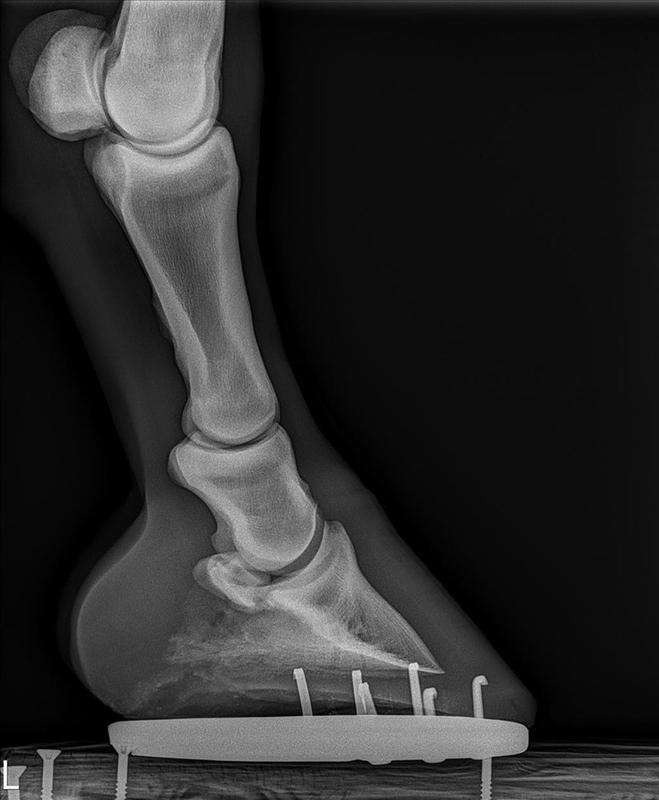 After confirming that Lola’s lameness was originating from her front left fetlock, Dr. Woodington took radiographs of her leg to pinpoint the area of the injury. The radiographs showed that Lola had sesamoiditis in her left foreleg. A horse has two small sesamoid bones in each leg, which are located at the rear side of the pastern. These act as anchor points for the two suspensory branch ligaments. 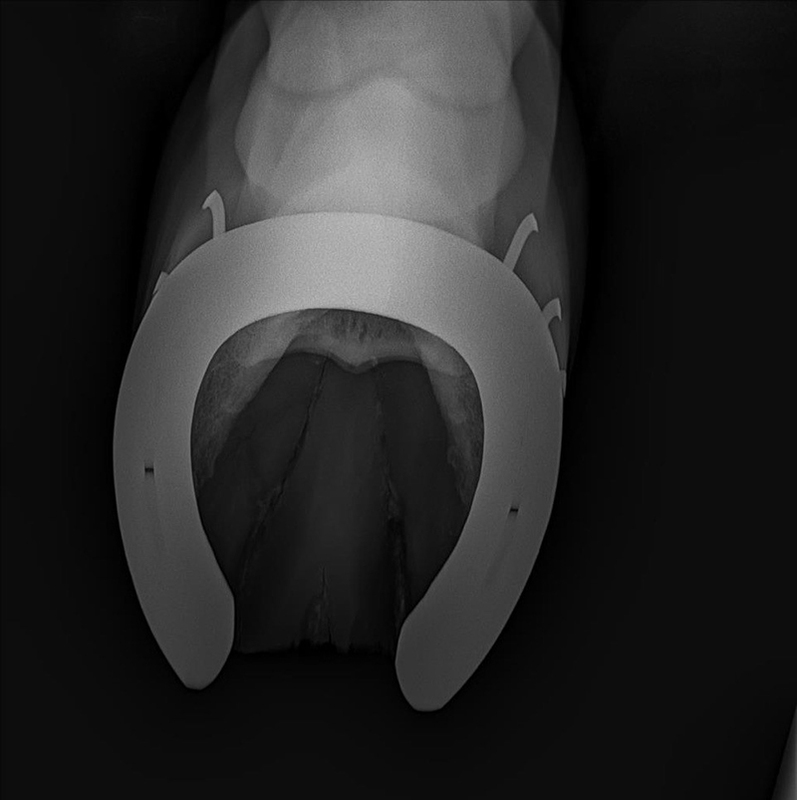 Thankfully, Lola’s sesamoid injury was caught early enough that there was no fracture present. 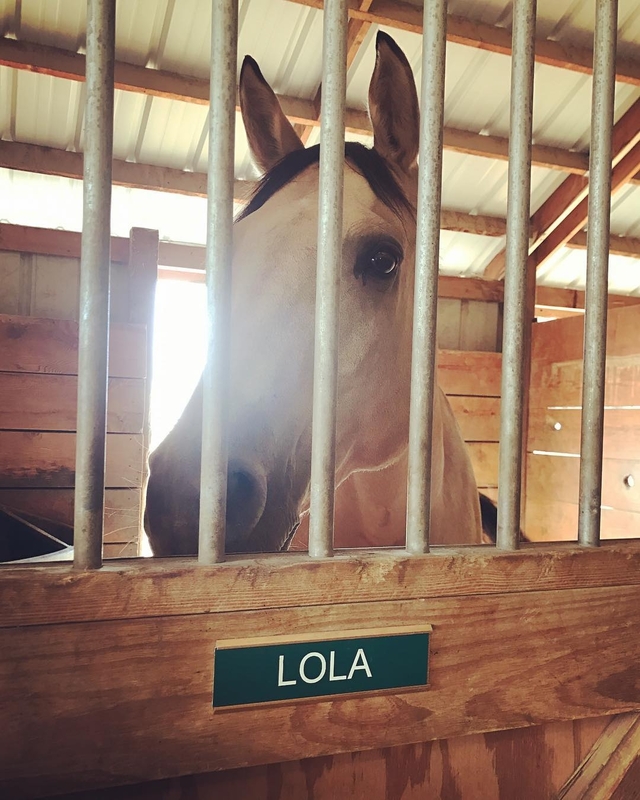 Fortunately, being that Dr. Woodington is a former racetrack vet, he was quite familiar with Lola’s particular injury, since it is very common in race horses. Although it was not an insignificant injury, Dr. Woodington admitted that he had seen a lot worst, and rated her injury a 6 of 10, on a scale of 1-10 in severity. 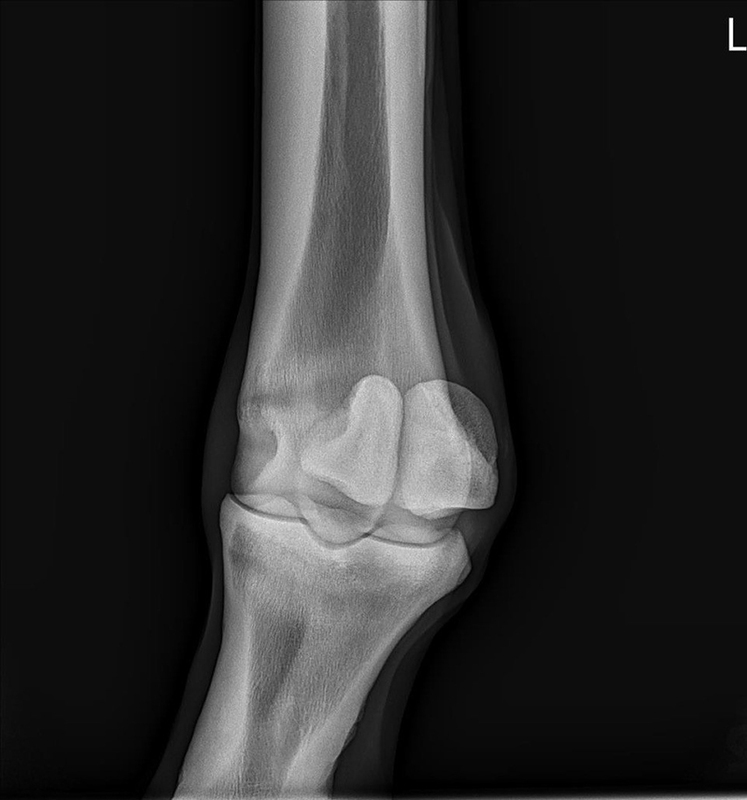 Injuries to the sesamoid bones are most common in young racehorses. It was quite an unusual injury for Lola to sustain, given her age and being a dressage horse. Lola was immediately put on a strict rehabilitation program. She was to be kept on stall rest for the next 2-6 months. Dr. Woodington recommended pulling Lola’s shoes and trimming them to help relieve pressure in the heel of her foot. They also discussed future shoeing options to help further support and to continue to relieve pressure in her heel. Jena was advised not to keep Lola’s legs wrapped all the time, unless there was swelling, to help reduce the risk of a bowed tendon. After the first initial two weeks, Lola began 20 minutes of daily hand-walking sessions added to her rehabilitation program. 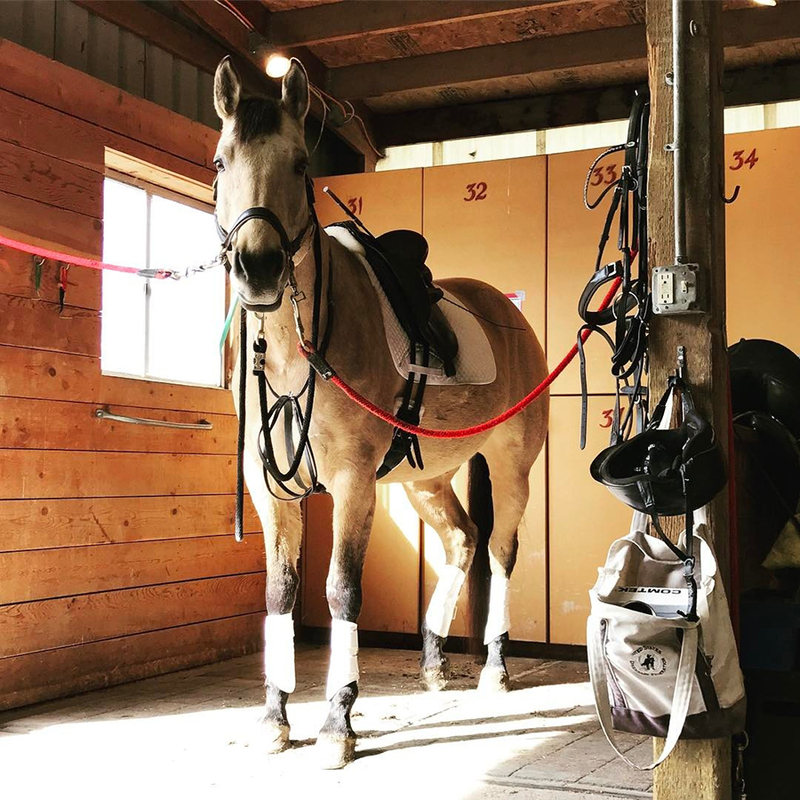 Thirty days from Lola’s initial diagnosis, she was able to begin limited turnout in a small paddock connected to her stall. Two months later, Lola had a progress exam with Dr. Woodington to monitor how her leg was healing. He took another set of radiographs of her left foreleg. Everything looked like it was healing nicely, but still needed some time. Since Lola is used to being very active, with dressage lessons 3-5 days a week, keeping her on stall rest has been a bit of a challenge. Jena has been working on teaching Lola some tricks and ground work to keep the mare’s brain active. Stall toys have helped as well! 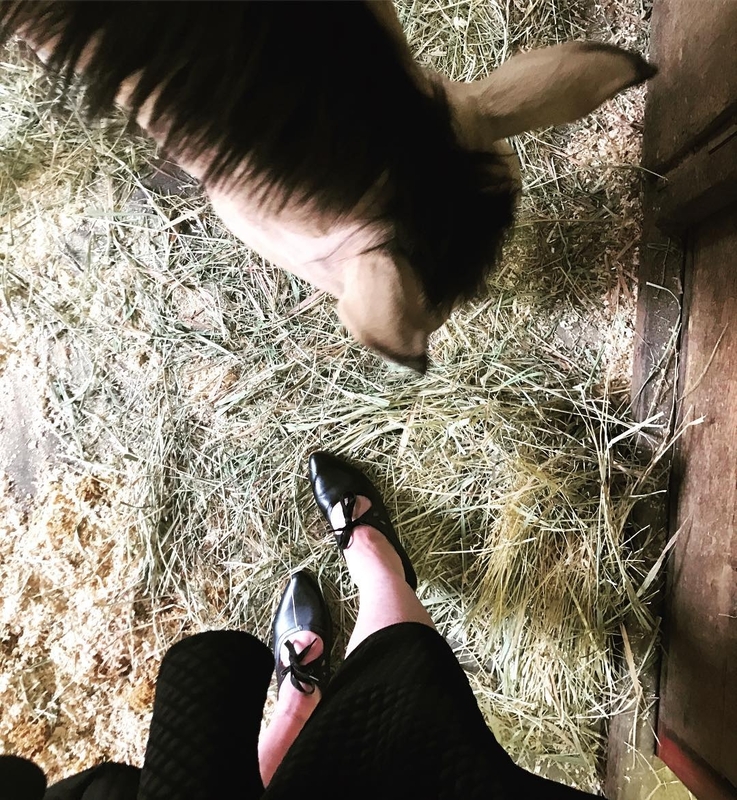 Besides being horse mom to Lola, Jena Von Teese is also a wife and mother to three children. She works at Dita.net, the global brand of her sister, Dita Von Teese, and Tweeterhead, a fan-favorite collectible studio, offering high end statues and busts from pop culture classics. 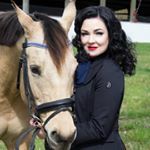 Jena was recently featured in Style Reins Magazine’s summer issue and is an equestrian ambassador and avid animal lover! 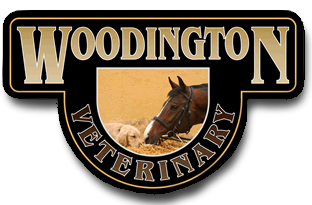 Woodington Veterinary, located in Eagle, Idaho, provides equine veterinary services to patients throughout the surrounding area. The practice was established in July of 2010. Dr. Woodington purchased Lakeside Veterinary from the legendary Dr. Charles Lange. Dr. Lange whom had been practicing veterinary medicine in the Treasure Valley since 1961.